Whilst attending a talk by Bristol DAWG at my local riding club, a white and black ex racing Greyhound, called Maggie, came up to me and put her head on my knee for me to stroke her, which I did without thinking. Well, that was it, I was smitten. I like to think she chose me so, with some very skilful talking and persuading, my husband said it was ok for us to have Maggie on a two week trial. He was concerned that it might upset our old dog Candy, who is fifteen, which I agreed was a worry. 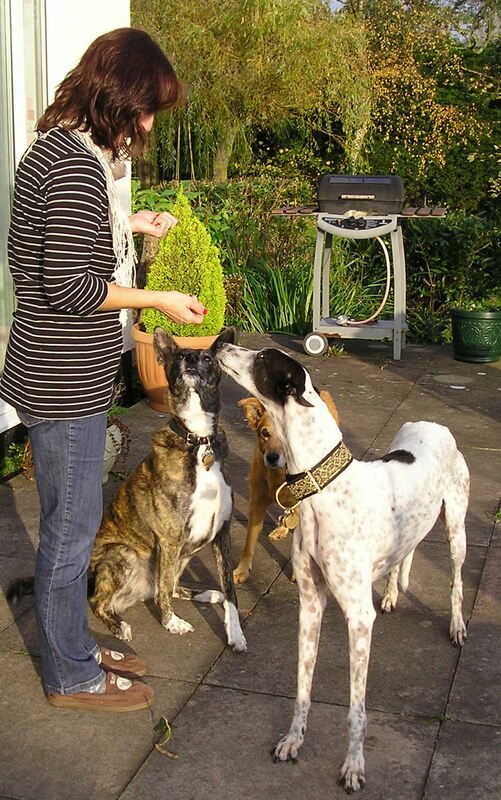 Kiera, on the other hand, our lurcher, needed a playmate, so I contacted Gerry from DAWG and she was delighted. Well, to cut what could be a very long story short, we have now fully adopted Maggie and she is a very welcome addition to our family. She is fab. So many thanks from me and Maggie to Bristol DAWG for getting us together. Oh and by the way Candy loves her and so does Kiera.